Kuta, Lombok to Ubud, Bali – Where's Walton? 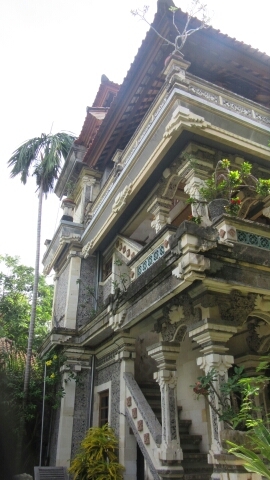 On 6th January we left our lovely homestay in Kuta, Lombok and were off on our travels to Ubud on Bali. Today’s blog post is simply just a summary of our journey. When I was in Caangu in Bali over Christmas to get to Ubud was a 300,000 taxi one way (£15) and it’s just an hour journey – there are stupidly no buses on Bali so as I didn’t have a scooter this was my only option. So I decided against going and holding off until I met up with Steven. Ubud sounded like my kind of place, very chilled out, lots of nice people, arts & crafts, yoga, culture, monkies and cafés… I couldn’t leave Indonesia without seeing Ubud. To get from Lombok to Ubud, only cost us 150,000 rupiah (£7.50) each. One of the pro’s of no longer being a lone traveller is that you get haggle more when there are two of you. It’s a full days trip x2 shuttle buses including a 4 hour slow boat. We were told we would arrive no later than 6pm, probably earlier. When I first started travelling, I loathed the travelling in between places because when travelling on ‘South East Asian time’ you eventually learn that nothing is ever on time, it’s never as it’s sold to you and you never have any idea what’s happening or even if you’re on the right bus at times. As time has gone on I’ve learnt this is normal and that you just need to go with it, be patient and follow thr group… sooner or later you end up where you need to be *Touch wood*. Today’s journey was no exception. Bus number one that arrived at 9.30am to take us to the port to catch an 11.30am ferry. Instead the bus took us to Mataram, the capital of Lombok out of the way from the port to drop off a lady at her hotel. Following this we randomly stopped at the side of the road and all four of us left on the bus (Steven and I and a German couple) were told to gather our belongings and to get off. Ok, let’s go with this. As we stood by the side of the road for a short while two mini buses showed up full with tourists. Two people got off and after strapping our luggage to the roof, they attempted to squeeze 4 of us into these buses. “Not gonna happen” shouted Steven at the driver “It’s two people off two people on, it’s basic maths! !” At this point they called a cab for the German couple we were with and we squeezed on a bus headed to the Ferry. Good work Steven. 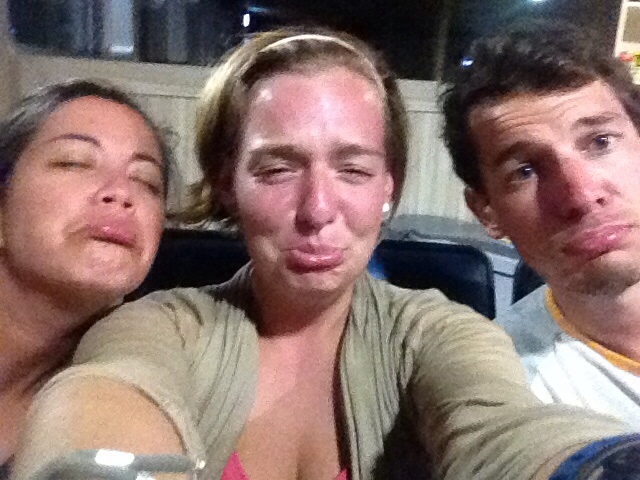 On this bus journey we met Diana, a German girl living in Sanur, Bali working at a dive centre. She’d been to Gili Air for a few days and was travelling back. We spent the rest of the day travelling with her and she was honestly so much fun to get to know and I really wish she came with us to Ubud. Another bonus of meeting Diana was she even had antiseptic and big plasters for my foot. Life saver! At the ferry dock, once again we got off and just stood there whilst men tried to sell us food, drink, whatever we needed. It was midday at this point so we’d clearly missed the ferry. No big deal, it’ll sort itself. But at this point no one knew where the Ferry was or when we were supposed to make a bee line for the docks. Steven got sold some overpriced chicken-rice that was just rice in a banana leaf so he pulled a strop. For some reason it does make me laugh inside when Steven is in a bad mood. He’s such a diva, but I really am enjoying having him around. It’s entertaining! On the Ferry we immediately found seats in a sweatbox, a sweatbox that cost us 10,000 extra for a seat. The ferry left at 13.10pm and after 5 hours on the boat we were almost at the docks in Bali when the Ferry came to a stop about half a mile from the shore. And there we remained…rocking left and right as day turned to night. We were going a bit mad at this point, we hadn’t eaten since breakfast avoiding the overpriced stuff sold on the boat. We had no idea how long the wait was until we heard two blonde western girls in a fit of panic talking to one of the crew. “Two more hours!?? What? Noooo!! I can’t take it anymore. I’ve seen 30 cockroaches.” It was all very over the top and dramatic, but at least we got the info we needed. We were on this boat for the long haul so we and 80% of passengers caved and bought snacks. At 8pm we arrived at 7 hours on the ferry that travelled only 40 miles across the sea and at 9.30 we arrived in Ubud via shuttle bus. We were sold a trip direct to our hostel but we were dropped off at a supermarket, the driver did not care what we had been “sold”. After a taxi attempted to rip us off I was up for walking it. I’ve just finished reading ‘Wild: A journey from lost to found’ by Cheryl Strayed, an inspirational woman who walked 1100 miles across the Pacific Crest Trail in the U.S alone with a massive backpack to overcome a divorce and the death of her mother. My journey is in no way the same but walking 1.4km to Sanya’s House with my beast of a backpack with my gammy foot felt like I was doing the same for a bit. 🙂 But Steven was not impressed I’d made him walk. 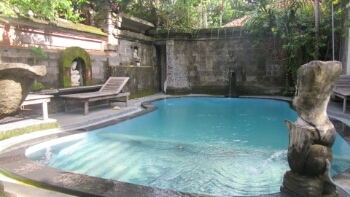 Our accommodation in Ubud was selected by our friend Gill, and Gill did good. Oh my stars Sanya’s House is unbelievable!!!!!! I have never stayed at a place like this before. 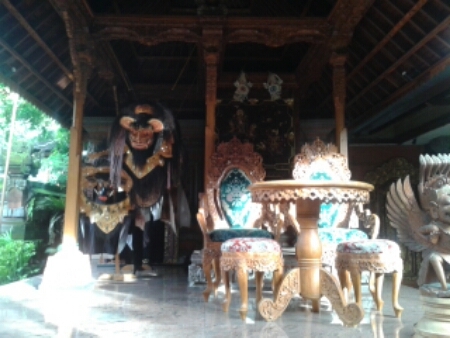 It feels like a mix between a M.C Escher painting and an Indonesian palace. 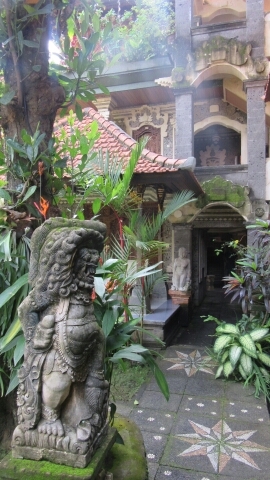 And you walk in you feel as though you’ve entered a temple with stairs in all directions, an outdoor library, a pool, breakfast and hot water…all for 117,000 rupiah (£6) a night per person. 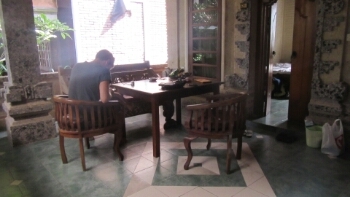 This place is made for royalty, not for three backpackers but we’re not complaining. At 10pm, Gill greeted us on the patio outside our room with sweets, treats and a yoga timetable.